Andrews Automation Ltd has developed a reputation for providing problem solving solutions for applications in a wide and varied number of industries across the UK. 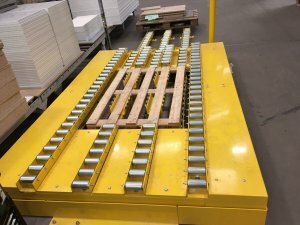 We were recently asked by one of our wood industry clients to look into providing a solution to a problem where they needed to get product stacks off the packing line and onto pallets. This would enable product to either go straight into stock or onto the back of a wagon. 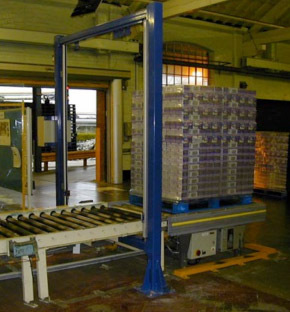 As the products were to be loaded onto Euro pallets, this enabled us to create a reasonably straight forward solution whereby empty pallets can be manually fed into the system and pneumatically lowered into the centre recess of the system. Once the pallet is lowered, product stacks will pass over the top of the waiting pallets and into position prior to collection. 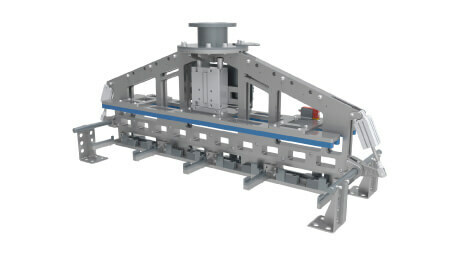 An operator will then activate the pneumatic control and lift the pallet so that it engages with the load, lifting it clear of the rollers the load was once sat upon. The pallet has now lifted to a point where it lines up with the exit rollers and palletised load can then me manually moved towards the end of the exit rollers. 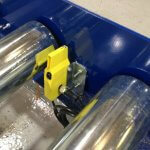 The exit rollers are split into three narrow sections to allow pallet collection either via fork lift truck or PPT. This particular version is a manually operated system with no powered components other than the lifting facility which is pneumatic. We are able to offer this system as an automated solution and as with all of our solutions, we are able to design them to meet a range of options and requirements.